Tarján (German: Tarian) is located in a hilly landscape with picturesque valleys and brooks. From 1727 onwards, it belonged to the Esterházy family who settled 40 Catholic families from the south and middle of Germany there in 1737. Before that, only Reformist Hungarians had lived in Tarján. The villagers made a living from animal husbandry and forestry. The forest community leased the woods to the Esterházys who frequently went hunting there. World War II and the subsequent displacement changed the village life significantly although most people were ‘only’ dispossessed but did not have to leave their homes. The village has nice, orderly residential streets. Many inhabitants work in viticulture. Amongst the wine press houses are several that are more than 100 years old. The region’s wines are very popular. The Roman-Catholic church was designed by Jakob Fellner and built between 1779 and 1783. Its current form was shaped in 1863. The oldest parts of its interior (altar, pulpit and confessional) were built in a historicised late-baroque style. In 2007, the church’s exteriors were completely renovated and the restored church was consecrated on October 26th 2008 – the church’s consecration festival day. 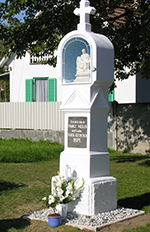 The village’s Calvary from the 1850s was completely destroyed in World War II. Between 2003 and 2004 the volunteer group “Friends of Tarján” restored it. It shows the suffering of Christ and is a symbol of peace and altruism. The chapel’s cornerstone was laid on May 31st 1858 by Johann Scitovszky of Nagy Kér, prince primate of Hungary and archbishop of Gran. The chapel is dedicated to Our Lady of Sorrows. Its restoration and enlargement was commissioned by the German organisation of denominational hospitals (Deutsch-Ordens Hospitalwerk DOH) in 1997. Every year in May, the congregation celebrates a holy mass with a litany and each October, a service with rosary prayer is held to honour Mary and Our Lady of Sorrows. 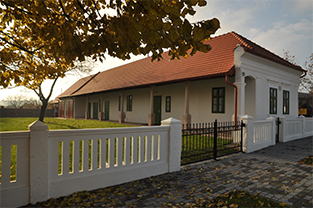 In the last years, many museums of local history have emerged in Hungary. 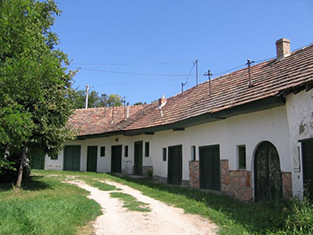 One of them is the heritage museum of Germans of Hungary in Tarján. 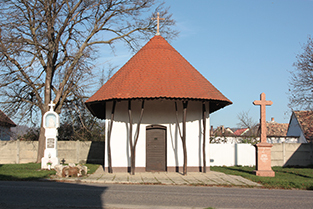 It is located in the village centre close to the Roman-Catholic church. The 100-year-old farmhouse belongs to the village, was turned into a museum and opened on Whitsun 2012. Josef Mikonya (1928-2006) who was born in Tarján was a local patriot and fighter for German heritage. He was the son of farmhands and first worked as a shooter in the Tatabánya mine, later as a steelworker. In 1973 he answered the demand “Use your quills” made by a newspaper and thus revived the literary scene of Germans of Hungary. His work “Crows on the Vinegar Tree” was published in 1994. Tarján has many foreign relations in the areas of education, culture, music, sports and economy. Official partnerships are held with Staufenberg, Kirchberg and Hattstedt. The wine press houses are up to 100 years old. RIGHT: In a corner of the chapel, a memorial column was erected. It shows Mary holding her son’s body. The Chapel of Our Lady of Sorrows is located on Tata Street. The house belonged to the family of Franz Kranz until 1948. Its main house consists of the front room (“vraunige Stuum” in local dialect), a kitchen (“Kuchl”) and an entrance towards the yard. From the kitchen, one can reach the front and back room (“hindrige Stuum”). Wealthy people would have had a beautifully decorated front room (“scheini Stuum”) and the back room would have been used as a bedroom. The kitchen was life’s centre, where everyone would have cooked and eaten.